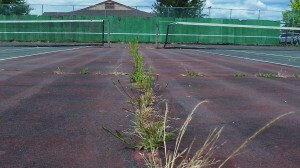 The view “after:” If more people used these courts, weeds would have no chance. A month ago I happened to notice the weeds on the tennis courts at Linn-Benton Community College and groused about the courts’ deteriorated condition. The college maintenance department said at the time it was about to do something about the weeds. And sure enough, when I took another look this week, the old weeds were gone. “Before:” A month ago, the weeds were taller. Only trouble was that new ones were coming up. As college spokesman Dale Stowell explained in June, the courts don’t get much use. The school no longer has tennis classes, and of course it has no tennis team. So even though the courts are open to the public, there’s no urgency in maintaining them. 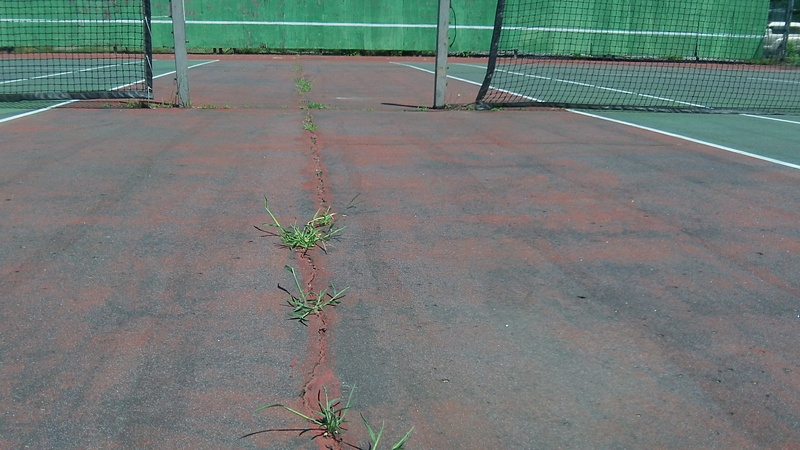 I wonder why there’s been an apparent decline in recreational tennis. My impression is that the few remaining courts in public parks or at schools don’t seem to get much use. So when they fall into disrepair, there’s little demand to get them fixed. Maybe the reason is that for tennis you need at least two people, while solitary forms of exercise such as running are easier to fit into a schedule.